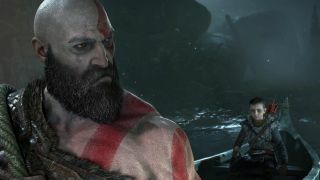 There's a God of War secret ending you don't want to miss. Here's how to find it. It's easy to miss the God of War secret ending because it's secret, it's kind of the point. However, it's something you'll want to see because things go off. Obviously a huge God of War spoiler warning here but if you want to find and see the God of War secret ending read on to see what it teases and what it could mean for Kratos' future. Once again SPOILER WARNING before you read any further as this well spoil both the end, and the secret end for God of War. Ok, still here? Nice one. Once you've scattered Fey's ashes in the mountains of Jotunheim, you'll get a mini-credits sequence. Think you're done? Think again Kratos. Instead, you'll need to go home and take a (long) nap. Go to the bed and interact with it to send Kratos and Atreus to sleep for actual "years". They've been through a lot, so they really deserve it. What happens next though, is the real God of War ending. It's not a long cutscene but it is incredibly significant. Thunder and lightning rages overhead, waking Kratos and Atreus from their slumber and turning the sky a strange shade of blue. Kratos flings open the door, and outside in the clearing stands a hooded figure. Kratos screams against the storm, "Who are you?" The cloak flutters back to reveal a very important hammer. Thor, anyone? Kratos and Atreus have presumably slept through the whole of Fimbulwinter and awake sometime on the cusp of Ragnarok. It's unclear whether Thor has arrived to seek revenge for the murder of his two sons, Magni and Modi, or to get help from Kratos and Atreus for the impending Ragnarok. Only time, a sequel or some mammoth story DLC will tell.